Face massage at spa. 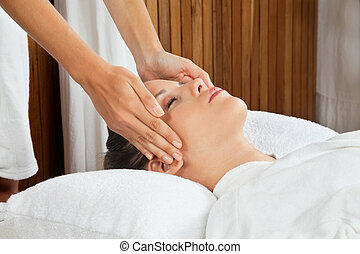 A face massage during a facial at a beauty spa. 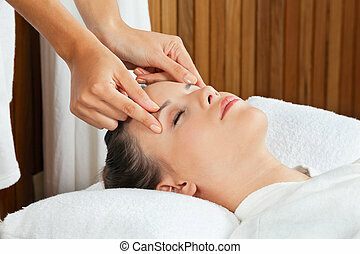 A face massage during a facial at a beauty spa. 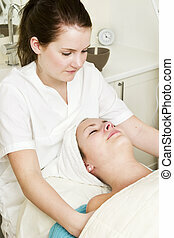 Beautiful young relaxed woman enjoy receiving face massage at spa saloon. Isolated on white. 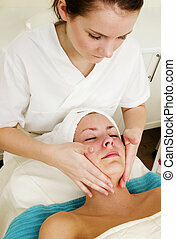 Woman receiving a face massage in spa. A female receives a lower back massage at a day spa. Relaxing during a facial at a beauty spa. Lotion being massaged in during a facial at a beauty spa.